The following article originally appeared on the Kennedy School Review and is republished with permission. Read it in its original form here. While Amazon continues to pilot its fully autonomous drone delivery system, Amazon PrimeAir, an autonomous delivery system millions of times larger is occurring at sea. And whether you are the passenger on-board a cruise ship or you hire a shipping company to transport your belongings overseas, in a few years, you will increasingly be at the mercy of a self-driving ship. 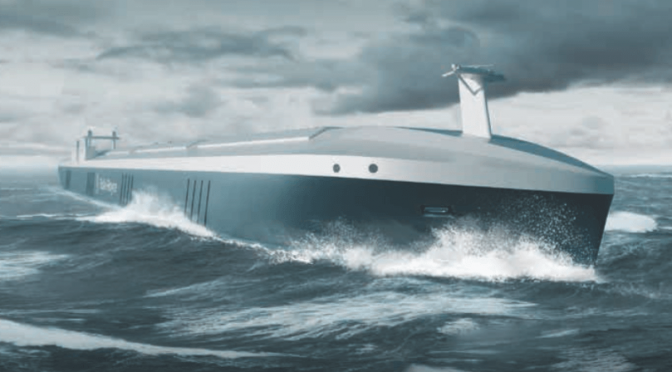 The prevalence of self-driving ships, or in more technical terms, autonomous surfaced vessels (ASV) or unmanned surfaced vessels (USV), which operate either remotely or completely independent of humans, is growing. And while for centuries mariners have sailed in awe of the ocean’s size and reverence of its might, the emergence of the self-driving ship ushers a new era of commercial economic opportunity as well as maritime security risks of miscalculation. Similar to self-driving cars, most of the technology necessary for the development of a self-driving ship is mature and available at reasonably low cost. Using state-of-the-art computer algorithms within advanced radar, navigation, acoustic, and optical sensor payloads, self-driving ships are expected to operate more efficiently and safely than those operated by humans. Self-driving ships present the opportunity for the commercial maritime industry to significantly increase profits through the reduction of costs associated with crew salaries, nourishment, fatigue, insurance, and decision bias. As described by the President of Rolls-Royce Marine Mikael Mäkinen, “autonomous shipping is the future of the maritime industry. As disruptive as the smartphone, the smart ship will revolutionize the landscape of ship design and operations.” While Rolls-Royce is vying to build the first autonomous smart ship with Google, other companies like the Norwegian company Yara seek to be the world’s first remote controlled and then totally autonomous electric cargo ship in 2020. However due to the technical complexity, lack of legal precedent, and political hedging associated with self-driving ships, one can expect the wave that brings higher commercial profits to also lower the propensity for international consensus on their use. Self-driving ships present challenges like those faced by federal and state governments today in implementing safeguards when introducing self-driving cars to the public. Yet unlike self-driving cars, these policies will need to address centuries-old maritime legal constructs, sovereignty protections, and universally established rules for how vessels interact on the high seas. The necessity of these policies to accommodate the commercial interests of ships longer than the height of the Empire State Building and communal practices of family owned fishing trawlers will be a significant challenge to policy makers. Unlike driving your car on a well-regulated interstate highway system, moving further away from a given nation’s coast corresponds with the transition of sovereign territorial waters to an international patch work of treaty obligations under the United Nations (UN) Convention on the Law of the Sea and regulatory organizations, notably led by the International Maritime Organization (IMO). With its UN mandate to promote safe, secure, efficient, and environmentally sustainable shipping, the IMO has an opportunity to advance maritime safety, security, environmental protections, and economic opportunity through its embrace of technological innovation. While the impact of self-driving ships will be a severe disruption to the commercial maritime industry, the technology will also punctuate a new era of maritime security strategy. Historically, the vast distance of the warship’s Captain from his state served to strengthen professional restraint while simultaneously weakening the temptation of jingoism. Using a command and control structure analogous to cyber and unmanned aerial vehicles (drones), an artificiality to the context of conflict engagement will exist between state authority and state actor. Development efforts underway today have already produced machines that can replicate some of the functions of fighter pilots and sentries, among others, and it appears inevitable that military system capabilities will continue to expand into areas traditionally the domain of human operators. Nations seeking to capture a maritime strategic advantage may see the application of self-driving ships as a force multiplier to maritime search and rescue, mine clearance, and offensive operations. Conversely some nations may view the application of self-driving ships as their relief valve to unusually high operational demands resulting in accelerated personnel fatigue and vessel deterioration. When coupled with future advances in sustainable energy sources (solar, nuclear, and lithium-ion battery), self-driving ships will become an attractive investment alternative for global powers in extending their ability to project power by sea. Undoubtedly this regional and global great power competition will heighten the risk of miscalculation and unintentional conflict escalation as evident in the December 2016 seizure of an American unmanned oceanographic survey ship by Chinese naval forces. For international maritime bodies, such as the IMO, International Seabed Authority, and International Whaling Commission, self-driving ships offer a low-cost approach for monitoring and reporting nation-state and private violators of maritime conventions. Through member nation financial support, the UN application of self-driving ships could respond to sustained maritime humanitarian crises while depoliticizing involvement and the risk to entrapment by member nations. This may serve as a pretext for the establishment of a sustainable internationally recognized unmanned maritime peacekeeping mission with the capacity to actively investigate illegal fishing off Somalia’s coast, resource exploitation near Fiji, environmentally damaging practices to the Great Barrier Reef, or freedom of navigation within the disputed South China Sea. However, before the rewards of self-driving ships can be realized, their challenges must be acknowledged, accepted, and addressed through a combination of active diplomacy, smart policy, and visionary thinking. Cameron Lindsay is a Master in Public Administration candidate at the Harvard Kennedy School and U.S. Navy Politico-Military Scholar. He is a graduate of the United States Naval Academy and Government Affairs Institute at Georgetown University. The views and opinions expressed are the author’s alone and do not represent the official position of the U.S. Navy, U.S. Department of Defense, or U.S. Government. While automation on commercial ships is increasing and our industry is experiencing a digital revolution, there is very little appetite by shipowners to move to autonomy right now. Too many unknowns and uncertainties, particularly regarding cyber safety and security, and many other factors. There will likely be greater advancements in HMI and data exchange, and how mariners will be trained, but autonomy in maritime trade is a very long way off. The intersection of cost of capital and cost of maintenance and daily expenses will determine when autonomy arrives. Currently there is little interest in raising the amount of working capital while taking the risk of autonomy in either the line or the tramp trades.